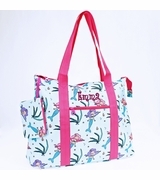 Practical and stylish insulated cooler tote bag. Front outside pocket has mesh bottom and will hold beach or pool items.... lotion, magazine or books, a few snack bars, cell phone and keys. Vinyl insulated inside for cold drinks. Plenty of room for water, sandwiches, fruit and veggies. 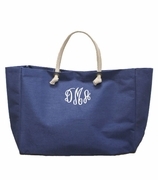 Tote this classic insulated bag to the park or your next outing.. Exterior side to side open pocket. 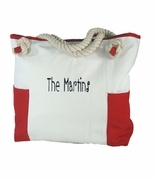 Vinyl insulated cooler tote bags measure 14"W x 12.5"H, 6.5" across bottom. Three sided zipper closure.